Once again, I had a lovely weekend. Two weekends in a row left feeling a bit more rested, a bit more calm and happy on the Sunday night. I'm thinking it's offically time to make this sort of situation a habit. This joy came from a collection of sources, from strolling the mall on Friday evening, with time to spare before meeting up with friends for dinner, to an insanely delicious eggplant parmesan dinner courtesy of the boy on Sunday night. Having the time to just wander around the mall can be delightful. Discovering new stores (Gilly Hicks) and new tops to wear out in NYC next weekend, perusing Anthropologie and stumbling upon the latest Kinfolk, in all it's holiday glory. I probably did a bit too much retail therapy but oh well, tis the season, right? While Saturday was filled with necessities (snow tires, gym, cleaning apartment, organizing clothes), it felt great to step back and look upon a newly tidied up residence, with Christmas music playing in the background, surrounded by newly hung twinkling lights and holiday candles burning bright. And then came the delectable dining experiences on Sunday. The boy and I joined my boss for brunch and devoured pecan sticky buns, sunny side up eggs, and more to satiate us a bit, that is, until we ventured over to Eat Boutique's Holiday Market, filled with people of all ages, eager to taste the samples and purchase gastonomical gifts for their friends and family. I made out well, with coffee syrup for my Dad (I know he'll be pouring the rich syrup over his nightly vanilla ice cream) and some super cute foodie stationary cards that I'm thinking will look adorable framed in my kitchen. But by far the highlight was having the opportunity to meet Joy the Baker and have her sign my copy of her baking bible. I've been following Joy's blog for awhile now, but what really drew me into her has been her Podcast series. They are what keep me sane on my daily commute to and from work. They entertain and inform me and I look forward to what she and Tracy ponder about each week. She is a prime example of a silly, fun, stylish female...that is also a business powerhouse that I aspire to learn from. Joy was fantastic; the line to have her books signed wrapped around the whole market, and although she was set to end at 3 pm, she continued until everyone had the opportunity to meet her. Friendly and warm in person, after mentioning my new kitten, she asked to see photos and gushed over my little guy. As I looked at how Joy had signed my book after I left, I was taken back by the full message she had left. Not a simple signature, or a standard "Best Wishes" but a full, beautiful message, encouraging me to "make many cookies and share the love." It was an absolute pleasure meeting Joy, a perfect model of how you can be successful and still humble and so kind. I left feeling inspired, inspired to be my best, and of course, inspired to bake. 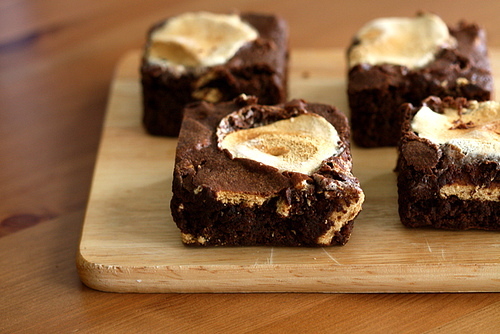 So, first on the list...these S'mores Brownies, discovered in the Joy the Baker cookbook of course.